I began my spiritual journey in the late 80's as I faced a life threatening dis-ease and began the path back to wholeness through Macrobiotics and Homeopathy. After years of realigning my body and spirit, I began to discover ways to release trauma on a cellular level. This lead to energy healing and finally to my own practice in energy healing. We are at a time in Humanity where the Old Paradigm where we thought, planned and acted from our brains based on external obligations and society's expectations is no longer our path. Rather to be guided by our heart's wisdom and soul consciousness. 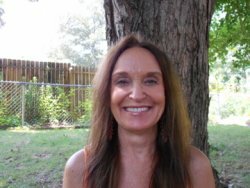 Some of the modalities incorporated in my healing work include: Priestess training with Kate Rodger (Institute of Modern Wisdom), Rebirthing with Sondra Ray, Shamanic Breathwork through Venus Rising at Isis Cove, and extensive training through Hippocrates Health Institute for raw foods. I believe a healthy body is balanced spiritually, physically, emotionally, and mentally. After reading Drunvalo's Flower of Life books and taking the Flower of Life workshops, I attended Drunvalo's workshops and trained in Mexico for The School of Remembering. This work is transforming... A way to live from the heart with guidance from our higher self and Source. And to do this unencumbered by the illusions and limitations we place on ourselves. Anchor into the Aquarian paradigm and awaken to your divine essence of unconditional love as you embrace your divine purpose. Life will start to unfold with ease and grace as we let go of old belief systems and open our hearts to the wondrous dance of co-creation with Source. Anne lives in the beautiful Mountains of Asheville NC and loves to travel if you desire a workshop in your area.